April 16, 2019--It's finished! I attended a needlepoint retreat in Ocean City, MD last weekend and was able to finish this beautiful project while there. All I had to do was sew the lining to each panel, then, using the binding stitch, attach all panels together. Love how it looks sitting on my sewing cabinet. 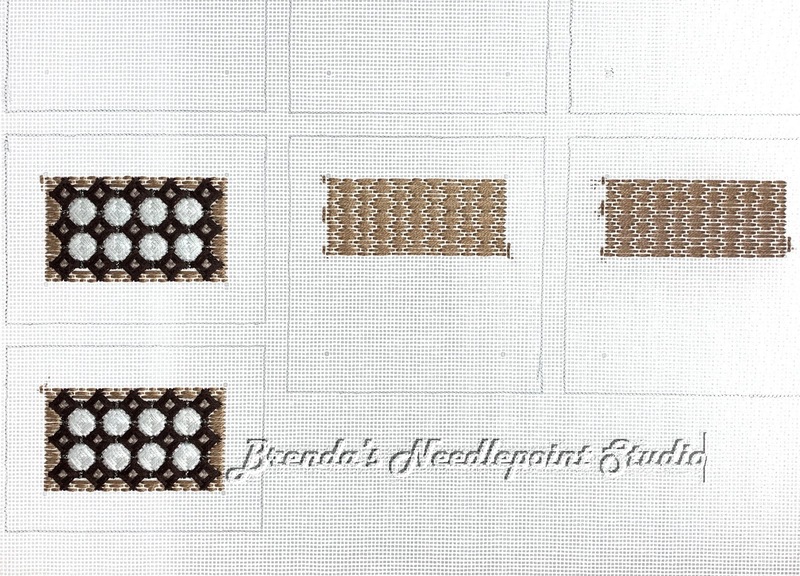 March 30, 2019--The pockets have been lined and put together, and all edges of the pocket panels, side panels and bottom have been cross stitched. All I need to do now is attach the lining to the back of all panels, then put the whole shebang together using the binding stitch. 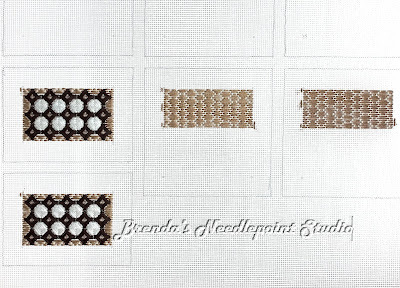 Here is a photo of the completed panels ready to turn into a box once lined. The only other issue I had was covering the "in channel" thread tails on the pocket pieces as shown in Diagram 7. Since I stitched the edges using only the cross stitch as suggested by Marilyn in her Day 1 instructions (not adding the "bar" as directed in the main instructions on page 9). 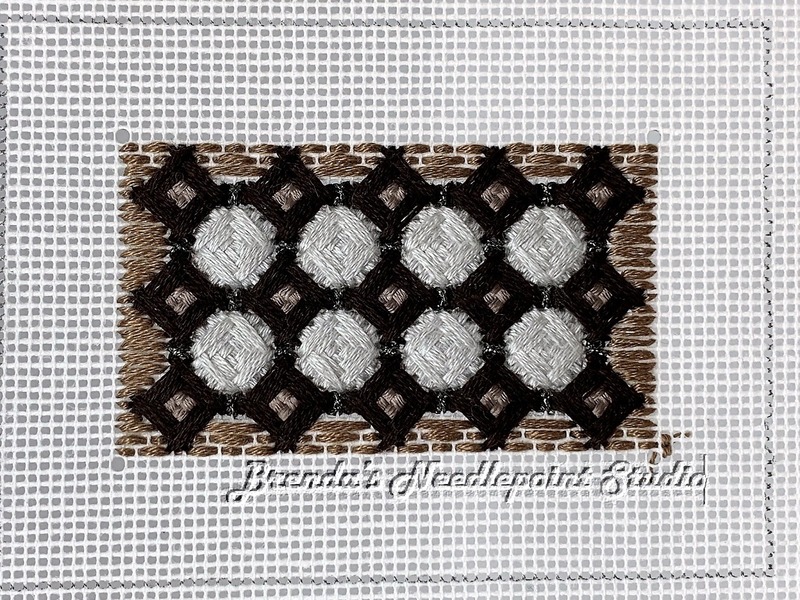 This meant the light brown pin stitches were showing under the blue/green cross stitches. So I undid the pin stitches and brushed the little tails outward so they were captured by the canvas fold before adding the cross stitched edge. Problem solved. 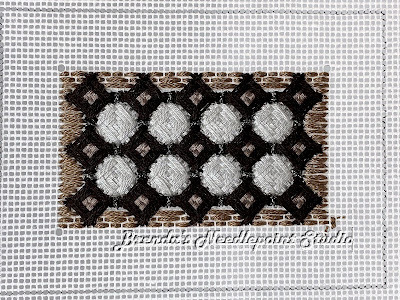 If you really look hard, you can see a "shadow" of brown threads, but they are not immediately visible. March 21, 2019--All the panels (4 sides, 2 with pockets, and bottom) are stitched. Let the finishing begin! March 19, 2019--Continuing to work on this cool Ort Box with a Twist. I'm a little behind--had hoped to complete the stitching in time for the CyberPointers March program of putting it together. Oh well... did print out the instructions by Marilyn Owen and will probably get it pieced together by the end of the month, if not sidetracked by something else. And there always seems to be a something else. Here are photos of side panels. January 31, 2019--The March, 2019 program of the CyberPointers Chapter of ANG will be led by Marilyn Owen on how to put together her Ort Box With a Twist. Of course, it needs to be stitched first in order to benefit from the class, so I purchased the instructions from the chapter and have started to work on it. So far I've stitched the two sides that have pockets, pictures below. 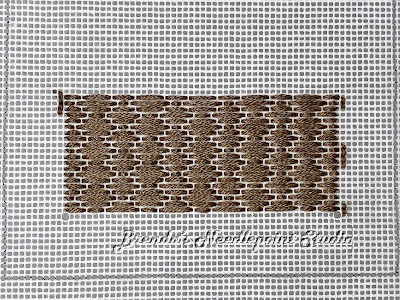 This is just the type of project I like to stitch--a wide variety of stitches with a bit of a challenge, yet small enough to be done quickly (sort of like immediate gratification). 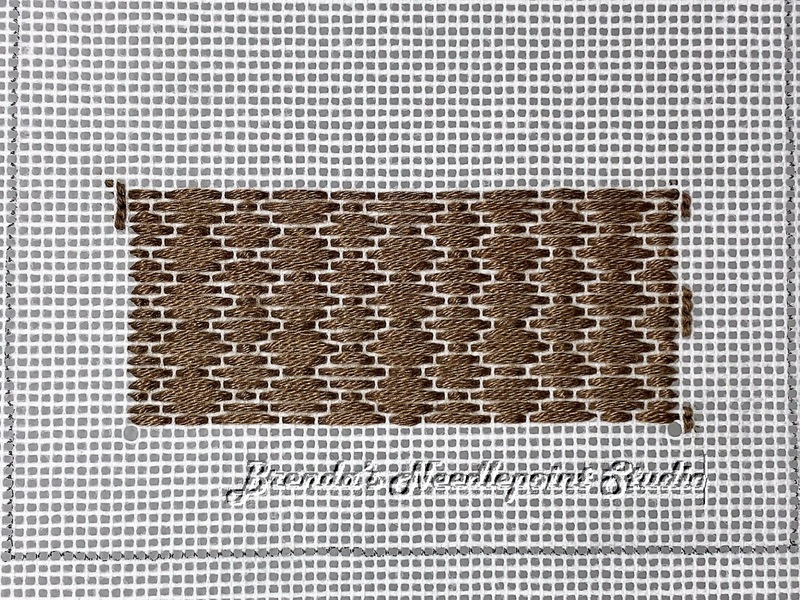 Marilyn's instructions are crystal clear and easy to follow with no blackwork. Yay. I've stitched 3 of Marilyn's ort boxes--a blue one for myself stitched with threads given to me by my mother, a pink one for my sister, also stitched with my mother's threads, and a black, silver and red one for my husband's desk at his office (which is now with me at home since his retirement). Click on the colors to link to each one. This new one "with a twist" will be a bit different from the others to put together, so a class will be helpful. PS: The instructions call for Caron Impressions thread to eliminate the need of using a laying tool. Unfortunately, I don't have much Impression in my stash, so am using DMC floss. It's a little more work, but manageable.